The semi-random thoughts and musings of my daily life... written, literally, from the laptop on my kitchen table. 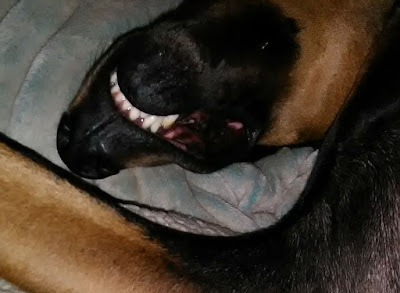 Seriously... don't his teeth look good? Jack's been feeling a little rough the last few weeks with mysterious swollen glands and a bit of a fever so when he rolled over on his back for a belly rub and flashed me a toothy grin, I had to get a picture! I'm so glad he's getting better!! And he's acting more like his normal goofy self every day now. Along the same timeline, I've been thinking that Lightning, Jack, and Gizmo all have pretty decent smelling breath and their teeth are looking a lot cleaner and whiter. Gazing at Jack's picture got me thinking about it and wondering why. That makes it sound like I think it's a bad thing... And nothing could be less true. Clean teeth are wonderful! Just a bit of a surprise because they were getting kind of gunked up and I've been dreading the lecture next time we get to a vet. Turns out I'm accidentally doing something right - the boys' favorite bedtime treat. Just about every night before turning the lights out we share an APPLE. The fleshy part of an apple contains a good bit of malic acid that helps dissolve the plaque and tartar on their teeth. (Pick the seeds out or cut away the core - the seeds have an arsenic-like toxin in them that you shouldn't give to your dog.) Other fresh fruits and vegetables help them have pretty smiles, too. Carrots and celery were especially noted. Carrots for the scraping crunch and celery because the strings act a bit like dental floss. Well, who loves their fruits and veggies? Yup. That'd be my boys! Gizmo isn't as much a fan of green vegetables or big pieces of carrot, but Lightning and Jack will eat anything I hold down for them. So they get fresh carrots and chunks of celery now and then. And pears, melon, corn on the cob (I hold it, they bite the kernels off), green beans, snow peas, cabbage, broccoli, cucumbers, peaches, plums, blueberries, strawberries, bananas... Lightning even likes lettuce, oranges, and tomatoes. I'm thinking he'll be hard on that future garden and orchard! Weird things for a dog to eat, huh? Overall, I think taking a break from Facebook has been a good thing. Clarifying. I had to login last night to find something and I found one friend in the midst of a cryptic meltdown, another left us hanging saying he'd gone to the ER with chest pains, and another had lost her sweet little dog. I left sad. I was sad that these horrible things are happening but even more I was sad that Facebook is the only way I know anything that's going on in their lives. It made me wonder if we are really friends or something lesser with that label on it for lack of anything else to call it. And if that's the case, it's just not good enough. I've been doing some other than school reading, too. And I think if you'll read these articles you'll walk away a bit smarter citizen of the world. They might challenge your views and make you mad but sometimes truth comes to you in weird places. Yes, he says “magical” way too often. Yes, it's an insult he directs at the liberal viewpoint in this piece about the Parkland shooting. And if you are conservative, especially in deep on the right, you can wipe that smug smirk off your face. Your side does the same damned thing. And this kind of exploitation is morally corrupt. Y’all need to just stop it! I would put a $5 bet that a majority of naturopaths and every traditional Chinese medical practioner on the planet is smacking their head and saying “Duh… ya think?” about this discovery of a new bodily organ. The unintended consequences of getting it wrong run really deep. You do need to read about China's former one-child policy. If you're at all like me, what you think you know isn’t even scratching the surface of the political and social ramifications. Jacky has been sick for about a week. His sublingual lymph glands are hard and swollen, he's been packing on the pounds lately, and he feels so hot when I touch him. Sometimes it seems like he wheezes but it's hard to call that a new symptom because he's always been breathy and melodramatic. When he really needs to go potty, he's the one that will get right in my face and do a full body wiggle while he vocalizes "hhhhhoooooooouuuuuuutttt" like he's trying to say "out." It's pretty hilarious but when he's such a goofball it also makes it hard to pick out behaviors that say this is what makes me think he's sick. And the internet is no help. The swollen glands could be anything from an allergy (we already have trees pollinating) to an injury (like from chewing on a stick outside) to a random bacterial infection to a thyroid problem like mine to cancer that would leave him about 6 weeks to live. Sadly, I don't have unlimited funds to spend at the vet... And he's eating, drinking, going potty, and sometimes playing with the other guys so I'm giving him a couple of baby aspirin night and morning to help with pain and inflammation and just trying to keep him active and comfortable in hopes it will work itself out. And like chicken soup helps us feel better, chicken broth slurped from my big cup seems to do him good. Reading about dog thyroid problems, which is somewhat prevalent in Dobermans, I learned they are treated with the exact same drugs I am. But vets recommend breaking the pill in half and giving in two doses, morning and night, to keep blood levels more consistent. Makes sense. And once again, veterinary medicine seems more advanced and patient-centered that people medicine. I always said about our vet in Georgia, if he'd see me I'd go to him over my own doctor! Pes (say w/long “a”) is a pretentious way to say foot, like that part you have running from ankle to toe. And I learned a couple of kitchen tricks! If you are roasting cherry tomatoes, like for a salad, a very very slight dusting of powdered sugar preserves their bright red color and keeps the dish pretty. Thanks for that tip, Alex Guarnaschelli! Keep your plastic wrap in the freezer and it will come off the roll without sticking to itself. You can actually get it to cover the dish just like Valerie Bertinelli did on her TV show. This has me irritated. Maybe more than it should... I am really irritated that people still find the need to share as if this was gospel truth. This article claiming that childhood vaccinations are the cause of not just autism, but pretty much every other horrible thing that can happen to your child, is based on bad science. Really bad science, in my opinion. But first, if you are a parent it is YOUR responsibility to make decisions in your child's best interest. You need to base those decisions on good information from both your pediatrician and your own research. Be an informed consumer. If you conclude that vaccines do more good than harm, then get your child vaccinated without guilt and second-guessing yourself. If you decide to forgo them, that is also fully your right. I AM NOT OFFERING MEDICAL ADVICE OR EVEN AN OPINION ABOUT WHAT YOU SHOULD CHOOSE TO DO. That's up to you! I am only explaining why I believe this article shouldn't be used to inform that choice and, hopefully, giving you some tools to spot bad science when you see it. First, you're going to have to read the article for yourself. While you are, notice some things that should be red flags any time you are reading an article based on a scientific study. There's no link back to the original study just the landing page of the publishing journal. You should be asking yourself why. We'll get to that in a moment. The supporting studies that are, oddly, linked are old. They are dated 2006 and 2007. This is 2018. Ten plus years will most likely have seen the findings in those studies obseleted many times over. There are a few exceptions but generally, you should base your decisions on research that's not older than five years. The author notes that the scientists conducting the study showed correlation. And she hints that they recognize correlation is not necessarily causation. Just hints at it with a single weakly worded sentence. Correlation means they observed a relationship between the variable (vaccines) and a result (an illness). Causation means they proved that the variable caused a specific result. This article wants you to believe these scientists proved something they did not. So... you're feeling some skepticism? Good! It's time to look a little deeper. The lead scientist's name is given and you know the topic. Google it. Google knows everything! Go ahead. Google "Anthony Mawson vaccine study." Dig through all those hits. See where the Journal of Translational Sciences, the publisher of the study's findings, has retracted it? When a peer-reviewed scientific journal retracts an article, it's a big deal. That's not a decision they come to lightly. It's an embarrassment to them so there has to be a very good reason. Except... You knew that was coming, didn't you? The Journal of Translational Sciences isn't a respected scientific journal. See the OAT at the top? It stands for Open Access Text. And if you dig deep enough, you see that oatext.com hosts a vast number of journals that you can pay to publish your study. They give the reviewers 20% off the top, even. You've heard the term "pay to play" on the evening news usually in regards to a government contract? This is what it looks like in medical research. And even they retracted this study! If you do find one of the copies of the original study that still shows up now and then (because someone downloaded a PDF copy when it was still available and has posted it somewhere again) and start reading there are more problems. John Q. Average probably doesn't know what a "cross-sectional sample" is in a scientific study so they may not pick up that what Dr. Mawson goes on to describe after those words is the survey of a "convenience sample." Convenience samples do not have the same validity because all they can tell you is the opinion of a group of people who choose to answer your survey questions. Think about who is going to choose to participate in any survey... only people interested in the topic (unless they are paid and there was no compensation involved in this particular survey) and ask yourself if that method provides a true representation of the entire population you are studying, in this case the American general public. 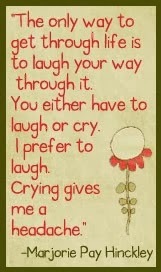 Sometimes it might. This is called generalization. Not being generalized is a big technical flaw in a study. Big. Huge. And consider the survey itself. He selected a bit more than 600 homeschooling mothers in 4 states and asked them if their children were vaccinated (not at all, partially, and fully were the choices) and what health problems those children experienced. No records review to see if their memory was correct. No independent assessment of the children's health conditions. No control group. Faulty data collection method, poorly constructed survey questions, no substantiation. There are also several issues with bias ranging from Dr. Mawson's role as an outspoken advocate for the anti-vaccine movement, funding from anti-vaccine groups to do the study, and using the same parents he surveyed to promote and disseminate information from it. Bias is a bad thing in scientific research because it can lead you to swing results to a pre-determined conclusion. If you're cherrypicking for the answer you want, is it really research? Vaccines are a subject where I have no expertise so I can't offer you an opinion about whether or not they are a good thing. And that's not the point I'm trying to make anyway. What I hope you've learned from my dissection of Dr. Mawson's study is how to spot bad science in the future whether it's descriptive journalism in the popular media or seeking out a scientific journal and reading the published study findings. Good research and the truly awful exist side-by-side and are shared widely and quickly with today's technology. In a world where everyone sells themselves as an expert, be a skeptic. Ask questions and read critically. Use your mind instead of your emotions even when it's an emotional topic. Make sure you've got good information as the basis for your choice. Google is your friend - look up words you don't know. Consider both sides of the argument fairly. Today we celebrate the weather forecasting abilities of a rodent who should still be slumbering the winter away... Groundhogs usually hibernate until late March. And we wonder why people in other countries think Americans are weird? Our most celebrated groundhog, Punxsutawney Phil, saw his shadow on this sunny Pennsylvania morning (or at least it's sunny right now here in Mount Savage on the Maryland/Pennsylvania border) forecasting 6 more weeks of winter. My first thought was "Ugh! Winter... I hope he's wrong." Then I started to wonder how often he actually is right. According to livescience.com, Phil isn't very good at his job. He's wrong even more than the TV weatherman, the one we curse for being so often wrong, with an accurate prediction of spring weather's arrival just 39% of the time. That's worse than the 50/50 odds of flipping a coin! But back to reveling in our oddity... According to legend, if our furry little rodent friend casts a shadow on February 2nd you should expect another 6 weeks of winter weather. If there's no shadow, then you'll experience spring-like conditions. 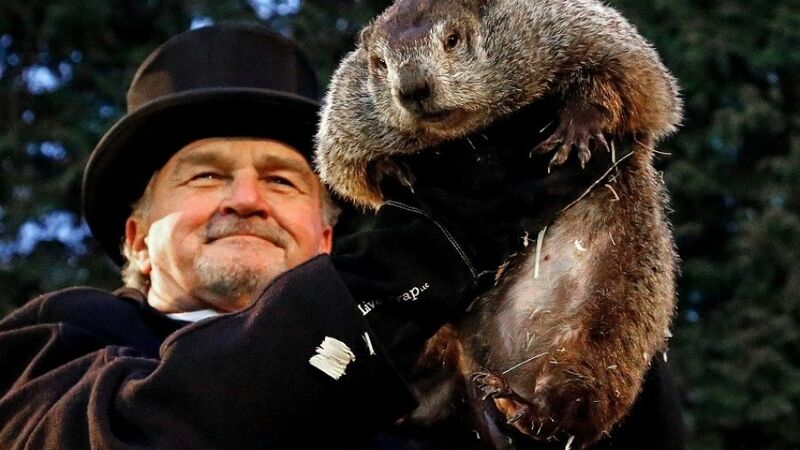 Records of his predictions date back to the 1880s when German settlers meshed their Candlemas Day festivities with Native beliefs but it only gained great notoriety following the release of Bill Murray's 1993 comedy movie, Groundhog Day, where he plays a weatherman reliving the day over and over again. Now thousands of people come from all over the country to this small town in Pennsylvania to gather on Gobbler's Knob and watch as poor Phil is pulled from his warm den to tell us when to expect Spring. Interestingly, like many of our modern holidays, Groundhog Day is a meshing of ancient Pagan festivities with the beliefs of a local culture which was then Americanized as people left the Motherland in search of safety and/or prosperity. Candlemas Day has roots in the Pagan holy day of Imbolc which marks the halfway point between the Winter Solstice and Spring Equinox. Superstition held that if the day was sunny and bright, the second half of winter would be stormy and cold. For early European Christians, it became customary to celebrate Candlemas Day by having a priest bless candles and distribute them to the community so a lit candle decorated a window of each home as a symbol of light overtaking dark just as the days began to lengthen. Literally, it was a Candle Mass. Some of the rhymes to help people remember this have also been saved, too. People who lived in rural areas not near enough to a church to participate in formal Candlemas Day celebrations marked the day by watching wild animals and whether or not they cast a shadow. For Germans, it was a badger. So, after they immigrated to America, the groundhog served as a replacement. Woodchuck, which is how groundhogs are known locally, comes from the native Deleware word "wojak" and is important to the Tribe's creation beliefs. According to the Deleware, woodchucks represent their ancestors from the time before they emerged from Mother Earth to live and hunt as humans. They are descendants of the woodchuck. And now you know what you're really celebrating... a mashup of weather predictions of Native ancestors on an old German holiday that's based on even older Pagan observances of solstices and equinoxes. Can you get any more American? Since February of 2008, Thomas S. Monson served as Prophet, Seer and Revelator and also in the administrative role of President of The Church of Jesus Christ of Latter-day Saints. He passed away Tuesday night. And while his wit and leadership will be missed, the feeling is happy. We are happy that he's with his much-loved wife again and imagining the grand reunions with her and other family and friends. There is surely a celebration in Heaven! Called to the Quorum of the Twelve Apostles before I was even born, he lived a life of service that is a reminder to me and countless fellow members to think of others in all the situations life throws our way. We treasured his stories about the lessons life taught him and his living example to seek out 'the one' who needs us most. We laughed with undying affection when he would wiggle his ears at Conference. And we all felt a little more confident that all was really going to be alright in this scary world when he told us to take heart. I met him once. It was a chance passing on a downtown Salt Lake City sidewalk but he had a sincere greeting and what I remember as the kindest eyes I've ever looked into. They bespoke pure love and then the corners crinkled up in accompaniment to his smile. Simple, uneventful... yet, an experience I remember. I also credit him with my own desire to teach principles by sharing stories. I loved it when he used stories of people he'd known to teach us how to be better people. Some might wonder what's going to happen to the Church now faced with a change in leadership. It's actually fairly simple. We'll celebrate President Monson's life with a beautiful funeral service in the coming days, listen with tears in our eyes as the last rendition of "We Thank Thee O God For a Prophet" is played just for him, and then move forward with the work of spreading the gospel. Succession is described well on mormonnewsroom.org. They explain that the First Presidency, the highest ranking administrative body in the Church, is dissolved on the President's death and the Counselors (similar to advisors) resume their place in the seniority of the Quorum of the Twelve Apostles, the second-highest presiding body. The Twelve (now numbering 14 with the Counselors) have the responsibility to oversee the progress and advancement of the Church worldwide under the leadership of the Senior Apostle. The Senior Apostle calls a meeting of the entire Quorum where they discuss two questions: Should the First Presidency be reorganized at this time? Or should the Church continue to function under the leadership of the Twelve? A motion is made and accepted. If the motion is to reorganize the First Presidency, a President is unanimously chosen and he selects two Counselors. Tradition, throughout the entire history of the Church, sees the longest-serving Apostle chosen as President. The second-longest-serving Apostle then becomes President of the Quorum of the Twelve Apostles (or third-longest-serving if the second-longest-serving Apostle is chosen as a Counselor). At the next General Conference, a sustaining vote is taken across the entire membership of the Church where we pledge to support these leaders in doing their work. Because of this process, we Mormon's are ready and able to move forward immediately. Russell M. Nelson is currently the longest-serving Apostle and we anticipate welcoming him as the new President sometime in the next few weeks and raising our arm to the square to sustain him at April General Conference. Holy is the Lord God almighty, the Holy One who makes all things new!! Prepared to Eat - Canning and freezing foods now so the family can eat later. Unless otherwise credited, all material (c) Kathy Burton, 2008-2017. Watermark theme. Powered by Blogger.